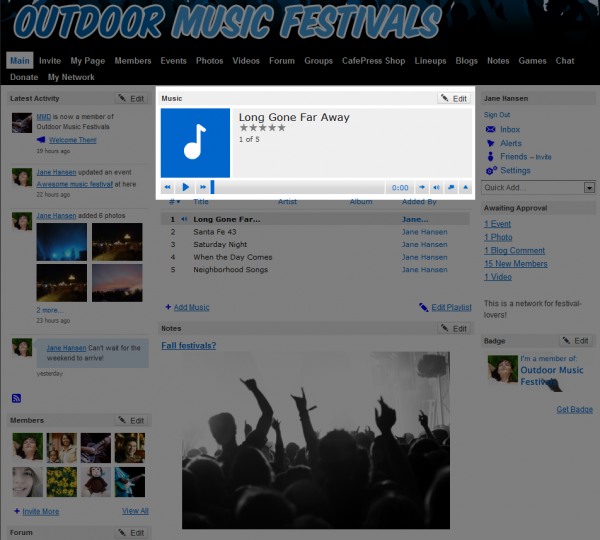 The Music feature on your Ning Network allows you to upload music and share it across the web. You can use the bulk media uploader to add up to 100 songs at a time to your My Page, or link to songs uploaded elsewhere on the internet. You can even add album artwork for your songs to appear in your music player while the song’s playing. Your Ning Network comes with a branded music player widget. It promotes the network and encourages people to check it out and join. Your Ning Network’s branded music player widget is a great and easy way to spread the word about your network, and you can embed it externally into almost any other website out there. You can share it on Facebook or MySpace or add it to one of 15 other services in just one click, or you can grab the embed code and paste it into your own website or blog. As the Network Creator, you have full control over which songs appear on the Main Page of your Ning Network and how they’re played when people land on the Main Page. You can also take advantage of your Ning Network’s music player widget, which is fully customizable. You can add a background image and pick colors for your Ning Network badges and widgets. Interested in featuring someone else’s music? See:Â Feature Content or Members on Your Ning Network. Check out the related articles for more information on using the Music feature on your Ning Network.